What is the best way to append live data to a file in Java? It’s very easy for developer to print output or some debug data to Eclipse Console using println(). But what if you would like to save data for later use? Well, in Java you could use log4.xml file file to store log statements to specific file location. 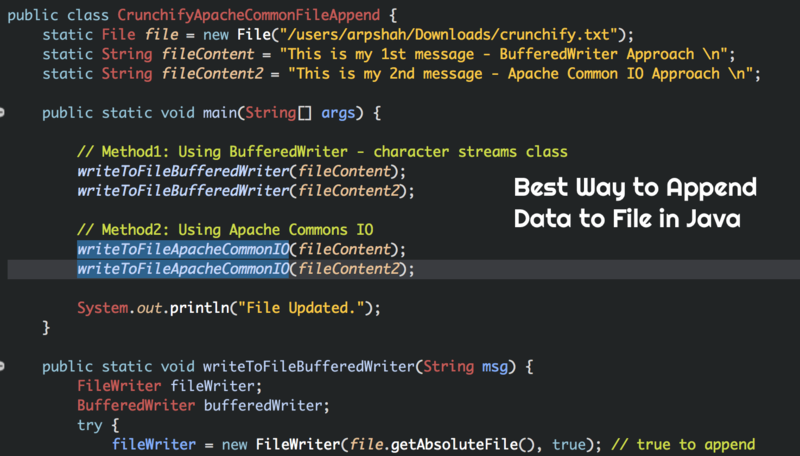 But in this tutorial we will go over two approaches to save data to file. BufferedWriter is a character streams class. It writes text to a character-output stream, buffering characters so as to provide for the efficient writing of single characters, arrays, and strings. FileUtils.writeStringToFile writes a String to a file creating the file if it does not exist. You need below maven dependency for this approach.